For those of you not into fashion, “the new black” is a term for a color trend that rivals black, which is always in style. In the case of real estate, the desirability of industrial space for sale or lease does not seem to be going away anytime soon. 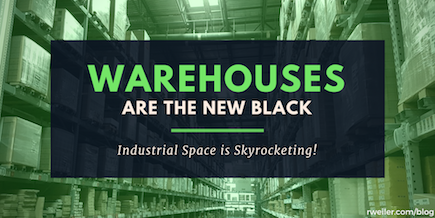 That’s because all reports indicate that industrial real estate continues to skyrocket toward all-time highs. As recently as last year, industry experts began noting that the demand for industrial real estate is outweighing the present supply. Low inventory has caused prices to increase twice or more from what they cost just one year ago. The driving force behind the surge? You likely already know. eCommerce has washed over us like a tidal wave, filled with free shipping, hassle-free returns, and endless inventory (all of which are available with just a few clicks). The online shopping movement continues to chip away at traditional brick-and-mortar stores forcing them to either join the competition or close their doors. In their MarketBeat U.S. Capital Markets Q1 2018 report, Cushman & Wakefield recognized a record-setting vacancy rate of 4.7% for industrial real estate. Additionally, in the Urban Land Institute’s 2018 Emerging Trends report, warehouses and fulfillment centers were considered the top two choices for investment potential. Low vacancies have begun pushing investors to explore new areas and consider purchasing land to build warehouses from the ground up. Major U.S.-based companies, such as Amazon and Walmart, are leading the pack when it comes to eCommerce and industrial real estate. With their increasing amount of fulfillment centers, consumers can order anything from electronics to cleaning products to groceries, and everything in between. And, to top it off, consumers can have their packages arrive in less than one day. The problem that companies and investors are running into now is that demand for space is so high that prices are skyrocketing, particularly in ideal locations. Real estate services firm CBRE found that the average price for large parcels of industrial land (50-100 acres) is approximately double the cost of what it was just one year prior; the cost of smaller industrial land plots (5-10 acres) is also soaring year-over-year by 25%. Think about what that can mean for the value of industrial spaces for lease! 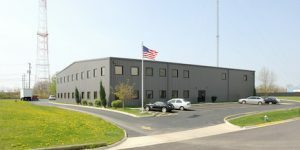 Why Columbus for Industrial Real Estate? Not only has Columbus become a favorite place for both Millennials and families to settle down, but it has also shown itself to stand out among other major U.S. cities within the industrial real estate realm. With the help of Columbus’ local development organization, Columbus 2020, the city has been placed into the spotlight, and expansion is already noticeable. So far, over $8 billion has been invested into the area and 150,000 new jobs created. Columbus, Ohio is a trending hotspot in all areas of real estate. As of April 2018, Columbus holds the number four spot in Realtor.com’s Market Hotness Index (a ranked list of hottest real estate markets). With a thriving college community and several incentives to stick around post-grad, the population is rising while the unemployment rate is dropping. Columbus Ohio’s proximity to other major U.S. cities. Our city is within a mere one-day’s driving distance to nearly half of the United States as well as a significant portion of Canada. As such, Columbus is central to a broad spectrum of potential consumers; a perfect situation for finding and leasing your warehouse space in Columbus, Ohio. Major businesses are finding success here. In addition to being headquarters for brands like Bath & Body Works, DSW, Lane Bryant, and Victoria’s Secret, Amazon and Macy’s have also opened large fulfillment centers here within the last year. Even Facebook will have a data center nearby in New Albany as early as 2019. Think about the potential for a wholesale business, right here in Columbus! Columbus, Ohio is more cost-effective, as compared to other areas. Getting into an up-and-coming area will be much easier on your wallet as compared to other popular industrial real estate locations. For example, availability in coastal markets, such as southern California and New Jersey, have just a 1-2% vacancy for newcomers, which shoots the cost for rent or purchase way up. The cost of living here is ideal. With all of the shopping, sports, and entertainment amenities that Downtown Columbus has to offer, when paired with an affordable housing index of 77, it becomes the ideal location to live and work. It was recently found that over 68% of homes in Columbus, Ohio are affordable for the median income. Have Your Bags Packed for Columbus, Ohio? Let Us Show You Around! Cassady Avenue Industrial Park. 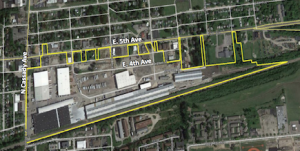 Spanning 13 buildings on 55+ acres of property, Cassady Avenue Industrial Park offers an incredible value for investors seeking proximity to both Downtown Columbus and John Glenn International Airport. The industrial park is also conveniently located off of I-670 and near major arteries such as I-270 and I-71. A multi-tenant industrial space for sale, the property currently holds 52 businesses of various types and sizes. The Cassady Avenue Industrial Park is priced at $9,200,000, and offers a cap rate of 12.07% with 99% occupancy. Call us at 614-245-2225 for more details. 777 West Swan Street. Located in the Grandview section of Columbus, Ohio, this two-story office/warehouse is a great opportunity for your business. The property is adjacent to State Route 161 and minutes from I-670, I-70, and SR-315. It is also 10 minutes from Downtown Columbus and 15 minutes from Port Columbus International Airport. Grandview is a small community of 7,000+ residents; however, it is part of the greater Columbus region, which has experienced fantastic growth over the last few years. The West Swan Street location offers a lab, warehouse, and office space, as well as a four-car garage building and 32 parking spaces. This property is available as either industrial space for lease or priced for sale at $4.5 million. Call us at 614-245-2225 for more details. 1099 Sullivant Avenue. 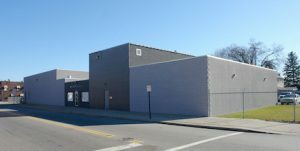 A competitive industrial space for rent at $7/square foot per year, this office and warehouse space is located in the up-and-coming Franklinton section of Columbus, Ohio. If you are not aware, a slew of Fortune 1000 companies are located within miles of this property, namely Big Lots, Limited Brands, Cardinal Health, Scotts Miracle-Gro Co., and Bob Evans Farms. The property also boasts proximity to John Glenn International Airport, as well as all of the major arteries. 1099 Sullivant Avenue is in the perfect community to open or relocate your warehouse or manufacturing operation. Call us at 614-245-2225 for more details. Time IS Money… Call Us Now! In this ever-changing real estate climate, assessing the current and future statuses of the market can prove to be a challenge. Get in touch with one of our knowledgeable commercial brokers today at 614-221-4286; leverage our expertise to find an optimal industrial space for lease (or sale), at the best price, to suit your specific needs.